There’s been a lot of tire talk lately, which is great. Winter is coming, and you obviously want to be prepared. We want you to be prepared, too. So, we thought we’d go over the four types of tires you are permitted to use when driving high mountain passes and other signed BC highways requiring winter tires for passenger vehicles. What else should you know? Studded tires with studs up to 2 mm are allowed on BC highways from October 1 to April 30 (one month after winter tires requirements). Vehicles weighing less than 4,600 kg can have up to 130 studs per tire, and vehicles weighing more can have up to 175 studs per tire. It’s also important to note that you should use studded tires on all four wheels for optimal control. Legally, you cannot have studded tires only on the front wheels. What else should you know? Full winter tires with the mountain/snowflake emblem maintain good traction in winter conditions because they are composed of a rubber compound that stays soft in cold temperatures. They also have an aggressive tread design for added traction on snow and ice. What else should you know? All-weather tires are the newest type of tire designed to counter winter conditions. What makes them different from standard winter tires is they maintain good handling in both cold and warm temperatures, but can be kept on the vehicle year-round. However, they are made of a compound that is not as soft as standard winter tires, so they do not perform quite as well in cold temperatures. Still, the compound is softer than all-season tires. What else should you know? All-season tires will not perform as well as standard winter tires in severe conditions; however, all-season tires have a shape and tread design that gives better traction than summer tires in snow and ice. The tire industry indicates M+S tires are made of a hard compound that offers reduced traction when temperatures dip below 7C, compared to winter tires with the 3-peaked mountain and snowflake symbol. All of these tires are legal on highways with winter tire requirements between October 1 and March 31, as long as they have a minimum 3.5 mm tread depth. Tip: pick up a tire depth gauge – they are inexpensive and available at most stores that sell auto supplies. For maximum stability in cold weather and on ice, snow and slush, we recommend using standard winter tires with the mountain/snowflake emblem. On the other hand, if you only drive in a milder area (ie. Lower Mainland) that gets rain rather than snow, you may choose all-weather or all-season tires. BC’s diverse range of weather can make tire shopping confusing – we know. That’s why we created a website to help guide your decision. No matter what type of tire you use, your driving performance is one of your best defences against cold, snow and ice. Give lots of space in poor conditions. And remember, speed limits are for ideal driving conditions – think dry asphalt, warm weather, windows down, wind in hair – so, please slow down when necessary. Do you have any other winter driving tips or questions about winter tires? Feel free to comment below. I think they should banish the m&s designation. It confuses people. You would think a tire that said snow would work on snow. THEY DO NOT. They are utterly useless and a hazard because people think they must work, after all it Says snow… right on the tire…..
We agree that mountain snowflake tires offer better traction on snow and ice and we recommend drivers who travel outside the lower mainland install mountain/snowflake tires for cold weather driving and, for extreme conditions, carry chains. The use of Mud and Snow tires accounts for a large portion of the population of BC who live in the lower mainland which rarely receives snow. We hope that this helps answer your questions. I am wondering if studded tires are restricted anywhere during the “winter” months. I work in Alberta and will be driving through the mountains to get home to the island. I know that most of the lower mainland and island doesn’t require studs and I just wanted to know if there are any restrictions in those areas. Hi Sean. There are time period restrictions but not location restrictions. Studded tires may only be used on BC highways from October 1 to April 30, and the studs should not protrude more than 2 mm from the tread or traction surface of the tire. Use of studded tires outside of this time period may result in a fine. Safe travels! I will be traveling from Vancouver to Kelowna, I have a good set of M/S tires on my 2015 AWD Nissan Pathfinder, I want to pull a utility trailer with me, does the trailer require winter tires or M/S tires? Can I use M & S tires on the front tires and Winter with snow flake on the tire on the rear which is rear wheel drive. We are glad to hear that you are getting dedicated winter tires however, we are the experts in the best type of tire for your vehicle. Perhaps ask a local Mazda dealer? Hope that this helps! I am planning to go Whistler for hot spring on mid February, and will be back to Vancouver on the next day. I am not a winter sport guy so I only have M+S tires on my Subaru AWD car. I also check the corresponding road camera. The road condition is wet and not covered by snow. I know my tires reach the minimum safety requirement and I am a safe driver that have not had any accident, but since I have no experience driving to Whistler in winter, do you think I should rent a car with mountain snowflake tire or I should be fine with M+S tires? Thanks for your recommendation in advance! Thanks for connecting with us here and asking your questions. Your M+S tires (with a minimum tread depth of 3.5 mm) are the minimum legal requirement on BC Highways. For added safety and traction, we recommend you carry chains, in case you need them. Give yourself plenty of time, so you don’t have to rush and you should be fine. Happy trails. Hey Wilson, just wanted to throw my two cents in here, I work at a tire shop in Prince George, when I started here and the winter season was approaching, I wasn’t 100% sure what the rules where, so I called icbc and they told me M&S as well as the 3 peak snowflake are fine to run, I then called the Prince George RCMP and asked them and they told me (October 2017) that M&S is fine in town but illegal on the highway, to drive the highway you need the snowflake. Now with that being said, I could be wrong, just giving you a heads up of what the RCMP told me when I asked them about M&S and the snowflake. 2)	If it is written, it is so. With that in mind, the BC MVA and BC MVA regulations for current winter tire laws are based on how the ministry signs the road. We could sign the road indicating that only 3 peaked mountain snowflake winter tires are required. We do not have any of those signs. We only have signs indicating that both 3 peaked mountain snowflake and M+S are allowed. As such, on ministry controlled highways, both types of tires are allowed. (b) meet the specifications adopted by the Rubber Manufacturers Association to be labelled on a sidewall with the letters “M” and “S”. (b) the letters “M” and “S”. Would a tire labeled M/S (like the Michelin Defender LTX M/S) qualify as a M+S? Hello Murphy – Yes, tires labelled M/S, M and S, M+S and M&S are the same type. Thanks for asking! Are out of province motorists visiting BC required to follow the same rules? but I still learned a lot. However, I still have a question. Lillooet, through Pavillion, to Highway 97. They will be renting a vehicle at YVR. that trip at this time of the year. Your friends should tell their rental company that they will be travelling outside of Metro Vancouver and will require a vehicle with winter tires. They can also ask that chains be included in their trunk, should they need them. M+S tires are the minimum requirement and work best while in the lower mainland wet. Once outside this zone, those dedicated winter tires are the best choice. Hope that this helps. STILL CONFUSED BETWEEN ALL SEASON M&S TIRES AND WINTER TIRES M&S , I DRIVE LIMOUSINE (SEDAN , SUV STRETCH AND SPRINTER VAN). BY LAW WHICH TIRES SHOULD BE USED TO DRIVE ON SEA TO SKY HWY . AS I SEE BOARD ON THE HWY SAYS WINTER TIRES WITH SNOW FLAKE & PEAK . PLS SPECIFY DIFFERANCE BETWEEN ALL SEASON AND WINTER TIRES OR SNOW TIRES. Some winter tires will also include the M+S logo, which can be confusing we know. All-season tires will not perform as well as standard winter tires in severe conditions. M+S tires are made of a hard compound that offers reduced traction when temperatures dip below 7C, compared to winter tires with the 3-peaked mountain and snowflake symbol. All of these tires are legal on highways with winter tire requirements between October 1 and March 31, as long as they have a minimum 3.5 mm tread depth. For maximum stability in cold weather and on ice, snow and slush, we recommend using standard winter tires with the mountain/snowflake emblem. Hope that this helps. Can I use the following combination of tires, is there any ICBC regulation on the use of tires, any link? 1. Front two tires of different make and rear with different make all have same size. 2. Three tires of different make and one tire another make, with all have same same size. We recommend drivers use 4 winter tires that are evenly matched in tread type and depth; however – the BC MVA requires you to have a minimum two matching tires and those must be on your primary driving axle (even when driving a 4X4 vehicle). We strongly discourage mixing tires with different tread patterns, internal construction and size as this compromises stability, and should be avoided. Tires with different construction and wear carry the vehicle differently, affecting the overall operational safety of your vehicle in winter conditions. Hope that this helps. I travel from Chilliwack to Vancouver daily. Getting new tires but am still not sure if I should stud them.We are expecting a rough winter so is it worth it to stud tires in the Lower Mainland/ Fraser Valley? We recommend you use winter rated tires (those with the three-peaked mountain snowflake symbol) with 3.5 mm tread depth. Dedicated winter traction tires should give you the performance you need in the Fraser Valley, which can often see more wintery conditions than the Greater Vancouver area. I am trying to decide what type of tired to buy for my small SUv which is all wheel drive. I drove in the lower mainland and rarely to never on the mountains. Is it sufficient to use all season for highway driving this winter or is it safest to be using winter tires. I drive with my children on the highway daily so am hoping to make the safe-sensible choice. If you are driving in the Lower Mainland and not up into higher elevation areas with snow, all season tires with the M+S logo and at least 3.5 mm tread depth will be the best choice for you. Thanks for your question. Tires labelled with the M+S (mud+snow) logo are appropriate for year round use in an area like Victoria. I’ve been speaking with ICBC and the person is saying that an long as the front 2 tires match as per referencing the government website it’s fine. I have 4 winter tires I was getting the front 2 studded as I drive on a lot of icy roads I drive a Toyota Matrix. Is that legal ? tires may only be used on BC highways from October 1 to April 30 and the studs should not protrude more than 2 mm from the tread or traction surface of the tire. Use of studded tires outside of this period may result in a fine. Read the changes in the Act and the Regulations to get details on permissible studded tires. If you are using studded tires, you should have them on all four wheels for even traction. If using studded tires on the front of the vehicle they MUST be used on the back of the vehicle as well. Hope that this helps! i am movin$ to vancouver island next mont&. sorry computer dyin$, no aitc no jee. just West of Colwood an area called Millstream. W&ic& tires would you recommend? Winter tires with the 3-peak mountain snowflake symbol provide the best traction in winter conditions. Victoria has milder winters than the rest of the province, but winter conditions do happen, especially travelling up-Island via the Malahat. So what you are saying is that yeah your M+S is okay when really it’s not you need the M+S with the 3 peak snow flake that’s a winter tire. There is the legal minimum requirement and then there is our recommendation. M+S tires with at least 3.5 mm tread is the minimum legal requirement on signed highways (which is most highways outside the Lower Mainland). We recommend winter tires with the 3-peak mountain snowflake symbol. It is the driver’s responsibility to equip his or her vehicle based on the road conditions he or she drives. Do your all season tires have the M+S (Mud and Snow) symbol and at least 3.5 mm tread depth? If they do, they are acceptable on the Sea to Sky between October 1 and March 31. Please note: If highway conditions become very poor, the BC RCMP has the right to turn any vehicle around, even those with M+S tires and winter tires with the 3-peaked mountain snowflake symbol on them. Remember to check DriveBC.ca before you travel and give yourself plenty of time. Safe travels. I drive a sierra half ton in and around 100 mile house. This year I need new tires for winter. In the past I liked studded tires. This time if I choose a different type of tire how would I evaluate between an all weather tires and non-studded winter tires? Winter tires (those with the 3-peaked mountain snowflake symbol) are your best bet for the 100 Mile House Area. Is it legal to use cable chains, i.e. Cobra Cable Chains – http://www.canadianchains.ca/Passenger-Car_c_1.html on Lower Mainland Highways, e.g. Hwy 91 or on inadequately plowed city/municipal roads? These are cheaper alternative than buying four winter tires with the 3-peak mountain and snowflake marking. Perhaps just to be used when one get stuck in a sudden snowfall. Please advise. Thank you. I will try to find that info but so far all I’m getting are these general/generic safe answers that don’t help at all.. I have a set of conti procontact all seasons on my golf 7 and next week I will be driving up to Port McNeill to stay there for a month. I cannot figure out if the roads from Vancouver to PMcNeill are in good enough a shape for all season tire or do the driving conditions require winter tires? can you advise on this? Thanks for connecting with us here. We recommend drivers install mountain/snowflake tires for cold weather driving and, for extreme conditions, carry chains. However, if your tires have the M+S logo on them, and a minimum tread depth of 3.5 mm they meet the minimum requirements for acceptable winter tires on BC Highways. Here is a link to our winter driving website for more information: http://www2.gov.bc.ca/gov/content/transportation/driving-and-cycling/traveller-information/seasonal/winter-driving/winter-tires-and-chains/about-winter-tires We encourage you to check DriveBC before you go, so that you know what weather conditions lie ahead on your trip. Hope that this helps! SO here is a very Simple question, I have excellent winter ties that I purchased for a vehicle I had last year, I would like to put them on my new vehicle, however the tires are for a 16 in rim and my new vehicle has 17 inch rims. New 16″ rims that would fit my new vehicle and the winter tiers are available, but I was told by Canadian Tire that if I drop down a size from the manufactures recommendation of 17″/7.5, that Transport Can would consider any accident sustained with the smaller tire would result in my ICBC insurance being voided, thus leaving myself and Canadian Tire liable. I would like to take 4 near new 16″ Cooper Discoverer S/T Maxx Tires and place them on 4 new 16″ rims that are available and can accommodate the tires and fit on my new 2016 Jeep Wrangler Rubicon that specifies the current tire size as 17″/7.5. So really by dropping down to from 17″ to 16″ to make my jeep safer, I could be held liable? I cant seem to find any trace of this on TransCan or ICBC’s sites, please confirm. Thanks for connecting with us here. Unfortunately, this is a question for ICBC specifically. Here is their contact info: http://www.icbc.com/about-icbc/contact-us/Pages/Default.aspx Hope that this helps! I work in law enforcement for the provincial government , and I’ m subject to enforcing laws that legislators make with no real world experience or common sense,and with no real experience in actually enforcing the laws. This is just one more example of this….. M+ S tires acceptable for true winter driving!!!!! What a joke! This is a big mistake and really a waste of time, true winter rated tires with the snowflake and mountain symbol should be the minimum rating! It seams to me that the legislators are trying to accomidate the coast with a one size fits all approach. Here is my prediction!!!! And I’ve never been wrong!!!! The amount of accidents that will occur due to people relying on the minimum requirement of M+S will increase accidents and force legislators to change the law to either require the snowflake and mountain symbol as a minimum or require tire manufacturers to change the characteristics of the M+S tires to be more like that of the snowflake and mountain symbol tires. Just my humble opinion! And remember….. never been wrong…… okay one time but that was years ago!!!! This a complex issue that encompasses a wide assortment of issues, focussed on tires dedicated for roads covered with snow and ice. In the USA, these types of dedicated tires are called snow tires and not winter tires. The reason is that winter is a season, and not a road condition, and as such, in places like Miami, Los Angeles and Phoenix winter season generally represents different weather than what could be expected in Nome, Alaska. In British Columbia the winter season for the majority of the population is more about rain, or dry pavement that snow covered roads. 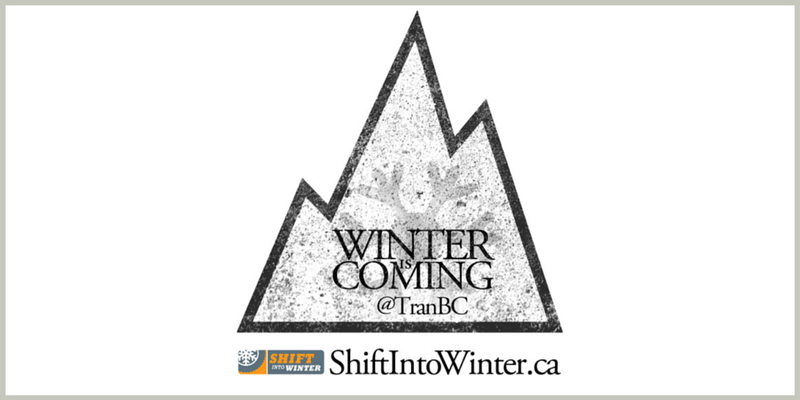 Making people convert to a dedicated “winter tire” for a single trip from Vancouver to Whistler, or Vancouver to the interior, when most of the winter season will be on wet roads or dry roads does not make good safety or economic sense. As such, the ministry has set a minimum standard for snow covered roads, in recognition that many people in the winter season may only encounter such snow conditions for a short time, and where different tires might be the better choice for surface road conditions drivers’ encounter on a much more regular basis. The ministry does always say that if the environment you operate in is more snowy and ice filled, then full “winter tires,” including chains is the better choice. We often point to the rubber association brochure on winter driving which indicates that, from a safety standpoint, drivers should always select tires that best suit the driving conditions they drive the most in during the winter months. I have to agree with the comment by Craig, the enforcement officer who is almost never wrong. The company I work for refuses to put winter tires on several of their 1500 Ram truck fleet vehicles even though we are in the Interior / Okanagan and have to access customers’ properties everywhere including two ski resorts. Until it is law, companies like this will continue to cheap out and expose their employees and the public to greater risk. Recommendations are not enforceable. Hi Dan – thanks for connecting with us here and sharing your concern. While M+S tires with 3.5 mm tread is the minimum requirement for winter driving in B.C. it is highly recommended that you use mountain snowflake tires and carry chains while driving high mountain passes like the Coquihalla and the Malahat or anywhere that severe winter conditions are likely to occur. 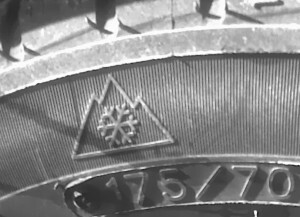 Unfortunately only tires displaying the 3-peaked mountain and snowflake symbol OR the M+S (mud and snow) symbol, with at least 3.5 mm tread are accepted as winter tires on BC highways. Drivers may wish to enhance the traction of their winter tires by carrying chains however, chains on other types of tires are not an acceptable substitute for winter tires on signed highways. Given their extraordinary load and the softer rubber used in winter tires, it is not feasible for commercial vehicles to run winter tires as would wear through them too quickly. This is why we have strict and explicit requirements for commercial vehicles to use chains and areas set aside for them to chain up, should winter driving conditions present themselves. Hope that this helps. Is there a chance that the use of new studded tire technology, such as the Nokian Hakkapeliitta 8 tire, will ever be approved for use on BC roads? They have considerably more than 130 studs per tire, but offer almost dry road driving control on even the slipperiest of roads. The Hakkapeliitta series tire is consistantly one of the highest rated studded winter tires in the world. Thanks for your question. Regulation has recently been updated from the traditional requirements for a certain number of studs per tire to a requirement for studs which do not protrude more than 2.0 mm. It has been found that tires with bigger (longer) studs are good for biting into snow and ice and providing traction in those conditions, however they do not provide adequate traction on bare road, because their height means very little of the tire (only the studs) are in contact with the road surface. Tires with smaller (shorter) studs are okay when on bare pavement, because more of the tire itself makes contact with the road. Here is the MVA language for you to review. Please note that subsection 1 below is the updated language, while subsection 3 speaks to older tires which have been grandfathered in until they are replaced with newer studded tires. Hope that this helps! Let us know if you have any other questions. Hello, I read your full post. I can’t understand that what is different between winter tire of summer tire. Is there special different? I mean i am new there and i have perched new car 3 month ago so i don’t know different between winter tire of summer tire. Please advice me hear by your post. otherwise i also will use winter tire in my future. Glad to hear that Wanda 🙂 Thanks for sharing! I have a 2002 Honda Accord, 6 cyl, and like to know if the front and the rear tires have to have the same tread pattern. Can they be different and which one should be on the front? Do winter tires wear faster than all season tires if used year around? Winter tires (those with the mountain/snowflake emblem) maintain good traction in winter conditions because they are composed of a rubber compound that stays soft in cold temperatures.They are meant for winter use only and will wear more quickly during the summer months. Regarding your tread question, you must have at least 2 matching winter tires on the primary drive axle, but we recommend using 4 matching tires on the four outside corners of the vehicle – even when driving a 4X4 vehicle. Mixing tires with different tread patterns, internal construction and size compromises stability, and should be avoided. Hope that this helps. I’m moving from Vancouver to Vernon in Feb or Mar. The local UHaul office was less than helpful about what their trucks are equipped with, and whether they’re rated to go over the Coquihalla or highway 1. I’ll also be towing our car on a trailer (full trailer, not just a 2 wheel dolly). Could you tell us what sized truck are you renting? It’ll be a 15 or 17 footer. I don’t know the weight of the truck – UHaul’s call centre isn’t overly helpful in this regard! The information on that page indicates that the truck has a max GVW of 14,050 lbs or 6372 kg. Commercial trucks weighing more than 5,000 kg GVW do not tend to use winter tires. That’s a great help, thanks. I had a chance to stop by a UHaul location, and they were much more helpful than the call centre. The tires are M+S, but they don’t provide chains. They’re a fairly standard size of light truck tire, so Canadian Tire has them in stock. Interesting, Canadian Tire’s return policy is 3 day exchange only. I guess too many people were trying to “rent” chains? All-Season tires as the 4th category mentioned above are permitted to use when winter tires are required. I have 2 pairs of ContiProContact tires which are introduced as All-Season tires on the producer website (Continentaltire.ca) while there is not any of above signs (M+S, snow sign, etc.) on their sidewall. Since continentaltire.ca seems to be the official website of the producer, can I consider my tires as All-Season & use them on winter tires required routes? I suggest taking a closer look at the sidewall. Photos online of the ContiProContact tires show M+S marked in small lettering. You are totally right. There is a M+S sign on the side of the tires. I have a plan to go to Whistler ski in this winter with a rent car. The rent-car has “all whether” tire. Is it OK with the Whistler road? Is it OK with your regulation about the winter season tire? I have a two wheel drive truck with mud and snow tires front and back. Traction on ice and packed snow was poor so decided to put studded on the back. Took them off in the spring. Now Canadian Tire refused to put them back on saying I needed studded on the front or they wouldn’t do it. It doesn’t appear to be a rule in BC and so is just another way to force you to spend more money. Very annoying. Thanks for sharing this information about different types of winter tires. Since it is getting colder out, I have been thinking about getting my winter tires very soon. I have never had studded tires before. Do you know if these provide better traction than traditional winter tires? 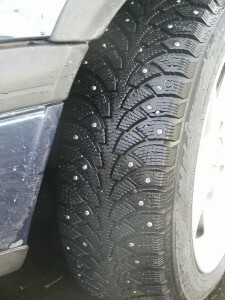 Both studded and non-studded tires with the 3-peak mountain/snowflake symbol offer good traction in winter conditions. We suggest discussing with your local tire dealer based on the conditions you tend to experience. We are coming to BC from the USA and purchasing tires in advance in the USA- do they have these same stamps or how do we know if the winter tires we buy will keep us from getting in trouble should we get pulled over in Canada? My husband has a 4×4 truck & he was going to get all seasons- will this be ok for travel through BC? Yes, tires available in the USA have the same 3-peak mountain/snowflake and M+S (mud and snow) symbols that identify acceptable tires in B.C. between October 1 and March 31. We recommend installing 3-peak mountain/snowflake tires if you are travelling through B.C., whether you have 4X4 or not. They offer the best traction in cold, snow, ice etc. B.C. weather can change quickly, especially through mountain passes. That said, all-season M+S tires are legally acceptable, as long as they have at least 3.5 mm of tread. Hope this helps. I have M&S tires WITH a winter snowflake on them. Is this an effective winter tire? Sounds like a win- win! Safe travels. I drove with all-season tires on my old car for 20 years and they did very well in the snow (although I grew up in Prince George and learned to drive properly on snow). I did purchase winter tires the last 5 years I had the car as I felt it would be safer and I hated them. I live and drive in Vancouver and I found in the rain that they were very slippery. When I had to make a quick stop they skidded a long ways. It really scared me driving with them. I have a new car now, but am hesitant to spend money on winter tires. Is this normal for winter tires to now perform well in Vancouver weather and road conditions? What is recommended? I seldom, but occasionally, drive to Squamish or Hope during the winter months, but rarely and not during any winter/snow conditions. Tires with a Mud and Snow emblem (M+S) with a minimum 3.5mm tread are acceptable for winter driving in B.C. The winter tire regulation was recently amended to include M+S tires with Lower Mainland drivers in mind. Hope that this helps. Thanks so much for sharing these four types of tires, and how to identify them. I really like that it is fairly simple to identify the type of tires you have. In fat, I’m not even sure if the tires I have on my car now are for all seasons, or just for the winter– I am going to check them out and see what they are! I will be making one cross-country trip to move from MB to Lower Mainland BC during the first week of November…I know what the minimum requirements are, but what is the ideal tire type for the historical conditions through mountainous BC during that time? I understand that I am unable to use my current All-Season Tires with chains any longer. Thanks! Hi Jen. Good question – thanks for asking. We recommend you have winter tires with the 3-peak mountain and snowflake symbol for driving from Manitoba to the Lower Mainland in November. To be honest, I had no idea that there were studded tires out there. It’s interesting to read that you can put these on during the winter months only. Where I live, we have a lot of snow storms. Maybe I should get some tires like these so that I can avoid slipping. The decision to accept M & S tires for winter use is as foolish as raising the speed limits on 15% of BC rural highways. Not one injury prevention organization or trauma specialist agreed with either of these ill-advised changes. All were ignored. This just makes it simpler for everybody, except for the misguiuded who actually believe that the trip over the Coquihalla or up to Whistler in winter really isn’t that or tough when it snows — and weather is so predictable in the mountains! To say that all weather tires are safe in all conditions is totally irresponsible. That’s why in some provinces, winter tires are the law. Period. For every vehicle, even rentals. The only circumstances in which all weather tires are acceptable all year round in BC are for those drivers who NEVER venture farther north than Burrard Bridge and east past Hope. These changes just give the false assurance that you can “get away” with all seasons. Will MotI be doing surveys of the mopuntains roads this winter to see what proportion of drivers actually do follow their “recommendations” for winter tires in the snow? Winter in British Columbia ranges from wet/mild to snow/freezing. We encourage drivers to be prepared, while at the same time, recognizing there are many times when the roads are not covered in snow and ice – people can make the most appropriate tire choices for when and where they decide to drive. While M+S is the minimum requirement on signed highways, we recommend mountain/snowflake tires and driving to the conditions. M+S tires are also acceptable in our neighbouring jurisdictions of Alberta and Washington. We live in Alberta and have a new van with M&S on the tires,are these legal to use while visiting BC this fall?Or do we have to replace the new tires with the tires with the snowflake and mountain on them? What are the regulations involving front wheel drive traction control van with severe winter tires, and two m&s designated tires? You must have at least 2 matching winter tires on the same axle, but we recommend using 4 matching tires – even when driving a 4X4 vehicle. Hope that this helps! 97% of the car tires sold in Canada have the M+S stamp or the Mountain/Snowflake (according to an industry representative interviewed on CBC Radio). So all the new signs on the highway are pretty much a waste of time. I wish the Minister would try driving the Trans-Canada through the mountians in a blizzard with all-season tires with (barely) 3.5 mm tread. While M+S tires with a 3.5 mm tread are the minimum requirement on mountain passes in BC, we encourage drivers who travel mountain routes regularly to invest in a good set of severe weather rated mountain snowflake winter tires. So it is ok for drivers who occasionally travel mountain routes and don’t have experience of driving them not to use real winter tires? They can take your advice that “All-season tires provide safe performance in all types of weather”. but will not perform as well as standard winter tires in severe conditions. As always, we encourage drivers to check DriveBC so that they are aware of the road conditions along their route and should drive to conditions at all times. Its a shame our government doesn’t take the advice of RTMA and require “snow tires” on mountain passes. M+S rated tires are the result of the initial introduction of all season tires in the 1980’s. Those tires had aggressive tread close to winter tires. Customers found them noisy and eventually manufacturers evolved them into todays (erroneously named) “all season” tires which have a tread not unlike the old summer tires .In fact true “summer tires ” are usually only available in high performance sized for specialized cars. Most good tire shops will dispute that all season tires are ok for mountain passes. It’s also important to note that despite the info saying 3.5mm is passable as tread depth, the industry standard (yes even in Canada) is to measure tread depth in 32nd of an inch. Most tread depth gauges are in 32s , few are in mm. My 3rd comment is about the placement of winter tires if only 2 are used. Tire manufactures such as Michelin advise if only installing 2 winter tires on a front wheel drive vehicle, that those tires are installed on the REAR of the vehicle NOT the driving axle as stated here. I know this sounds illogical , but the reasoning is if installed on the front, the greater traction can cause spin outs on situations of braking and turning at the same time or turning at too fast a speed. Regarding your comment about the number of winter tires required and their placement, the law requires that you must have at least 2 matching winter tires on the primary drive axle, but we recommend using 4 matching tires on the four outside corners of the vehicle – even when driving a 4X4 vehicle. Mixing tires with different tread patterns, internal construction and size compromises stability, and should be avoided. “Severe” is a weather condition, which occurs in seasons. BTW, there’s confusion over the Malahat Mountain Highway which BC refuses to sign as a Mountain Highway. Part of the confusion may be the term “winter tire” which does not mean “snow tire” as many people understand that term. There is mountain pass winter tire requirement signage at the entrance to Goldstream Park. It identifies the two acceptable types of tires for travelling over the Malahat. Due to a more temperate winter climate in the Lower Mainland and southeastern Vancouver Island, drivers are not required to use winter tires, although many drivers choose to use M+S tires year-round. Drivers should use discretion when equipping their vehicles. Hope that this helps. Oh and you can add to those on all-season tires in winter all the foreign tourists who rent cars at Calgary Airport and drive into BC. Ideal for driving while jet-lagged. Highway 1 east of exit 44 should be a Winter Tire zone. The Lower Mainland can experience non temperate weather in the winter. Motorists need to be prepared for severe driving conditions, even if it is only for just for 3 to 6 weeks of the year. The bottom line is that the driver is always responsible for their vehicle’s traction on the road. If you don’t want to make the investment in snow tires, then stay off the road.